We at Pray Up Cybercafe are so excited that you have found us and we hope you choose to look around and learn more about who we are and what we do here. Praying is the one most important thing we can do for anyone. We are helping one another, one prayer at a time. We have a place that one can Pray For certain things in one's life. We have a place that one can Pray About certain things in one's life. We have a place that one can Pray With someone about certain things or certain people in one's life. We have a place one can ask for Prayer Request and thousands of people will Pray. We have a place that one can join a Prayer Group of choice, Men's Prayer Group, Women's Prayer Group, Youth Prayer Groups and Military Prayer Groups and help others grow in CHRIST, for we can not do life alone. We have a place that one can become a Prayer Warrior and stand in agreement with others of the prayer need that they have. We have a place that one can learn about Sin. We have a place that one can learn about Repentance. We have a place that one can Pray the Sinners Prayer and be Forgiven. 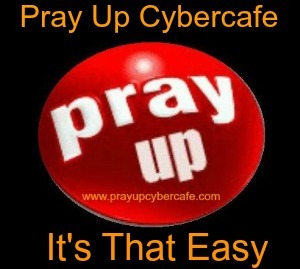 We have a place that one can join and become a volunteer for Pray Up Cybercafe. We also will always be interviewing for people to become owners of the website and take responsibility in helping the website to grow and reach the whole world with the gospel of JESUS CHRIST. Once again Welcome to Pray Up Cybercafe and we Pray that your visit is a blessing to you and that you may come to stay with us forever. Grace be with you always as well as the love of our LORD and SAVIOR.